After picking up the kids from school in Roma and travelling home the other day, we had to give way to a different type of traffic – not unusual for Outback Queensland. Thought I would pull over and take a photo. 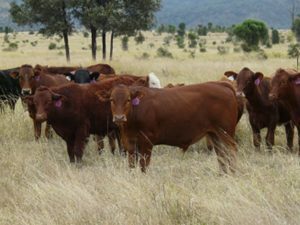 This mob of cattle is travelling the “long Paddock”, which is an Australian colloquial name given to the Stock Routes. 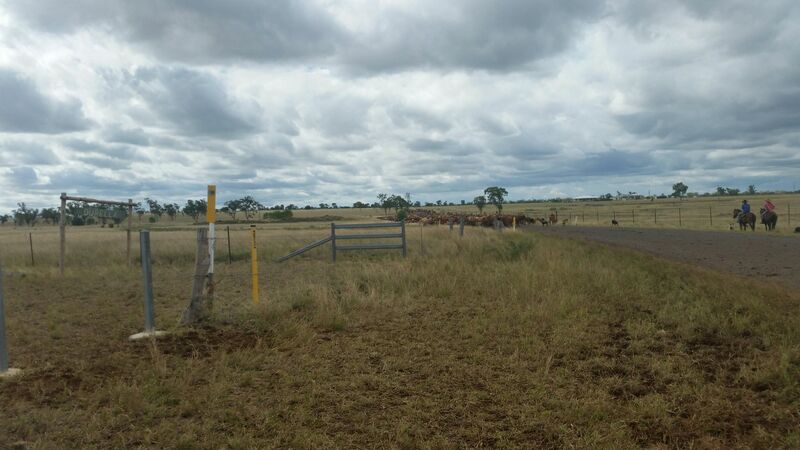 Stock Routes have been part of Queensland’s rural history for over 150 years. They are strips of gazetted land along which stock are allowed to walk from one location to another. Generally the stock routes follow river systems or old trade routes as these were the easier paths and provided water along the way. The use of Stock Routes declined through the 1950’s and 1960’s when infrastructure improvements made road transport more efficient and convenient. Today the Stock Routes are still used to walk cattle from one location to another and for grazing (agistment), particularly during dry times. A permit is required to use the Stock Route Network. Local Government is responsible for the day-to-day administration, management and some maintenance. State Government is responsible for the policy, legislative advice, operational guidelines and compliance. Permit conditions will limit the amount of head (number of c attle) in any one mob travelling along the route (this can vary between local authority areas), the distance required between mobs and a minimum distance that must be travelled each day along the Stock Route. Generally this is around 10 kilometres each day. Most of the time there are water sources (bores or water holes in Creeks) where the stock will camp for the night. If not, water is trucked in. The cattle are usually penned in an area overnight to avoid them wandering onto the roads where vehicles are travelling. Most things are much harder to see at night and cattle are not different. You really don’t want to hit one during any hours of the day or night and care should be taken driving our country roads in case the odd stray get out. The people looking after the stock usually have horses, working cattle dogs and/or bikes to help them move the stock. Often you will see at least one person up the lead, checking and closing gates that may be open off the Stock Route, turning the mob down this road or that, or just holding the leaders up to slow them down and encourage them to get their fill of grass along the way. After the mob passes through the Stock Hands will open any gates they closed again, leaving things just the way they were before they passed through. The people at the back (and often a dog or two, or four) will keep the stragglers moving forward. At night the people and their dogs will often camp around a fire near their herd, tell a few yarns and then climb into a swag to have a good night’s sleep before starting all over again the next day. If you’re travelling through Outback Queensland and see a mob of cattle on the road, slow down, take your time and make your way steadily through the mob, giving way to any that may walk across in front of you.